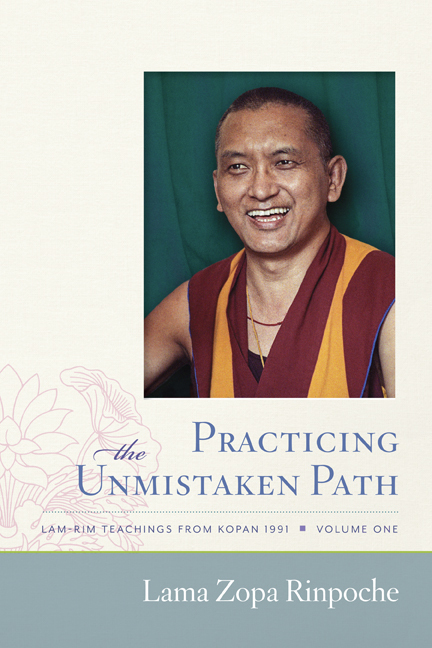 The first volume in an ebook-only series of Lama Zopa Rinpoche's teachings given during the 24th Kopan lam-rim course in 1991. This book covers topics such as compassion and universal responsibility, the benefits of developing bodhicitta, the disadvantages of self-cherishing, and emptiness. This series consists of four volumes of lightly edited transcripts that we hope will convey the feeling of being in Nepal for the one-month Kopan course. The second volume is titled Creating the Causes of Happiness, the third volume is Cutting the Root of Samsara, and the fourth volume is Cherishing Others: The Heart of Dharma. Get the ebook from your favorite source using the links below. You can read excerpts online in our August 2014 and October 2014 monthly eletters. LYWA Members can download the ebook for free from the Members Area.